When I started writing this blog I said that I would be writing about and showing you things I consider to be beautiful. Yesterday when I was riding my bike, I thought about how beautiful the path I was rolling across was to me, then I laughed. You see, yesterday it was blowing snow here in Chicago and there was a lot of snow and ice on the places where I normally ride. Beauty is in the eye of the beholder. I want to show you a couple of photos. 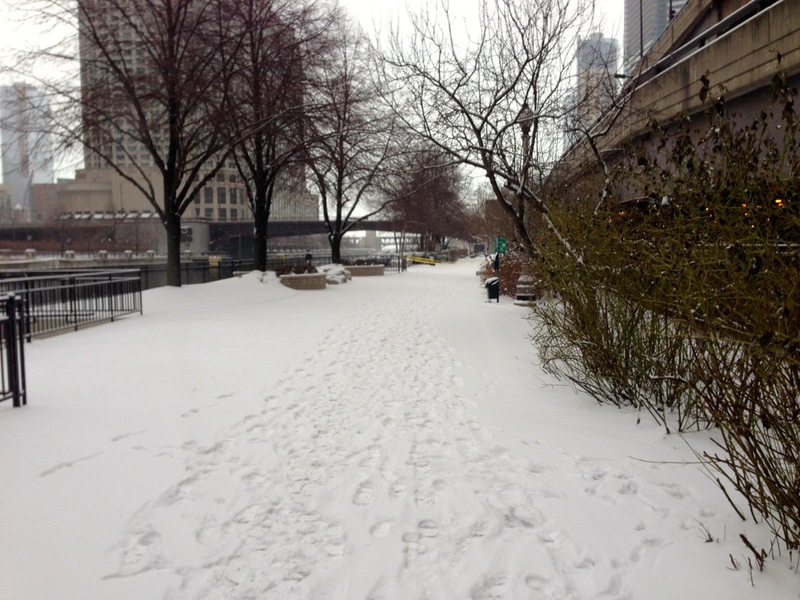 The first is the lovely Riverwalk along the Chicago River. Tourists come here and enjoy the view every day. This is the riverwalk where I ride every day. Obviously there is no bike riding across this very pretty landscape. For a bike ride, however, this is treacherous terrain and not to be trifled with. 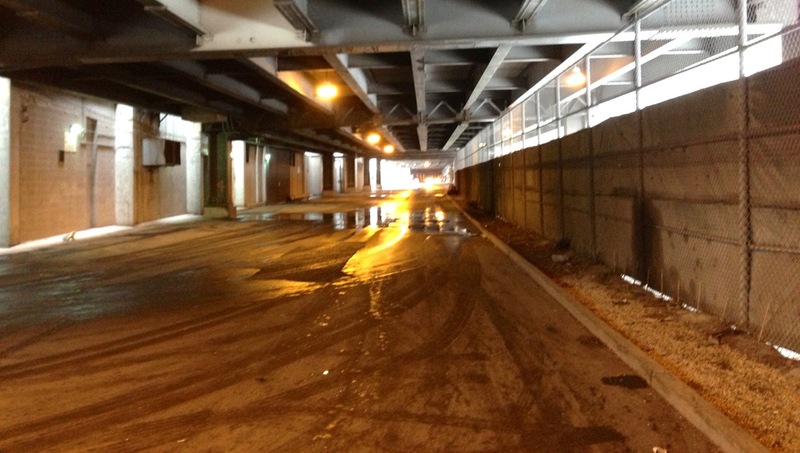 Below is a photo of Lower Wacker Drive. It happens to be adjacent to the lovely Riverwalk, but as you can see it appears rather unseemly. It looks dark because it is ‘underground.’ The street lights are necessary during the day, too. Not very appealing compared with the pristine beauty of the Riverwalk. To this bike rider, however, Lower Wacker Drive is a thing of beauty. I can ride my bike there in any kind of weather and feel protected from snow and ice on the ground, falling rain and wind gusts that could blow me off my bike. 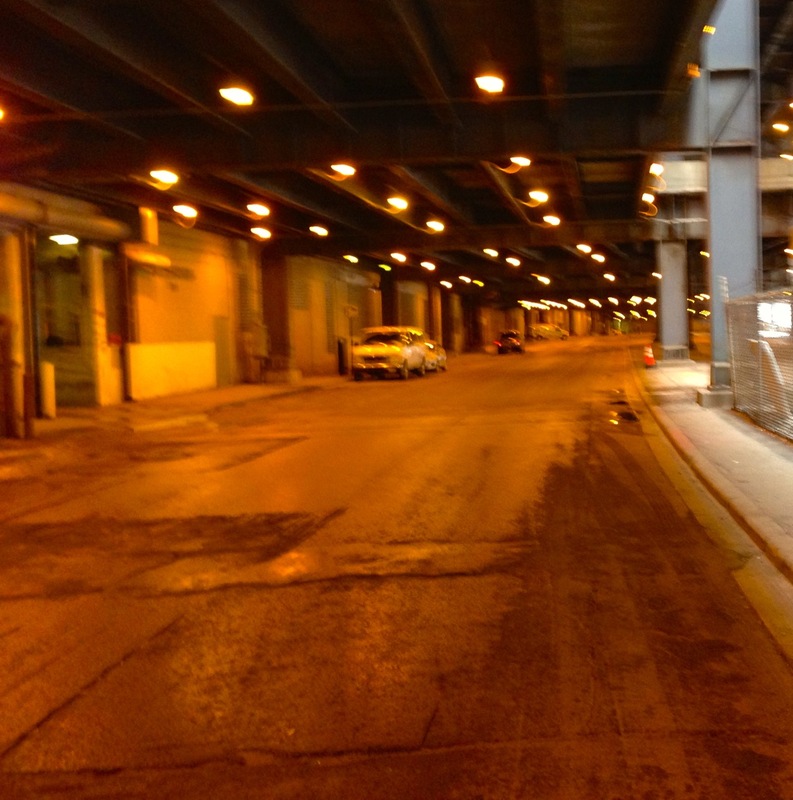 This is Lower Wacker Drive, not very pretty, but very protected from the elements. Absolutely beautiful! If you use your imagination, you can see how beautiful Lower Wacker Drive is to this bike rider. 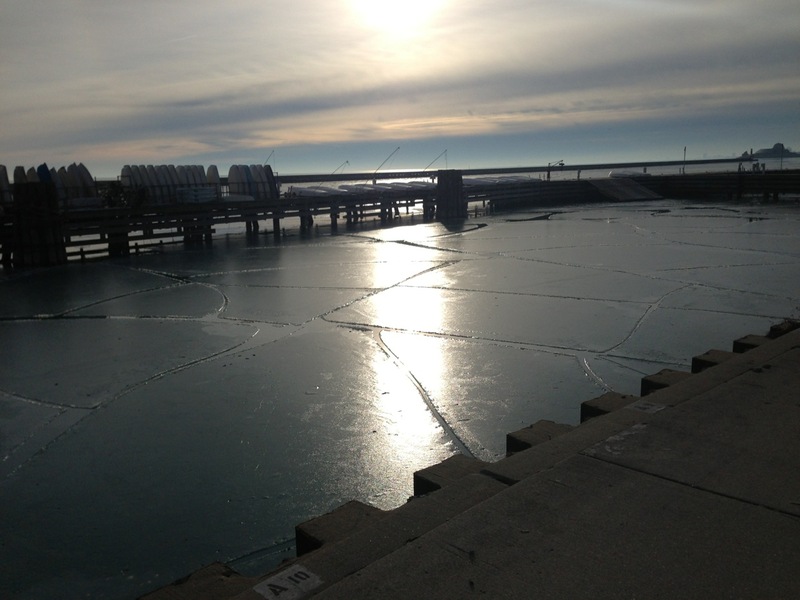 This is Lower Wacker adjacent to the Chicago Auto Pound, the fence on the right. 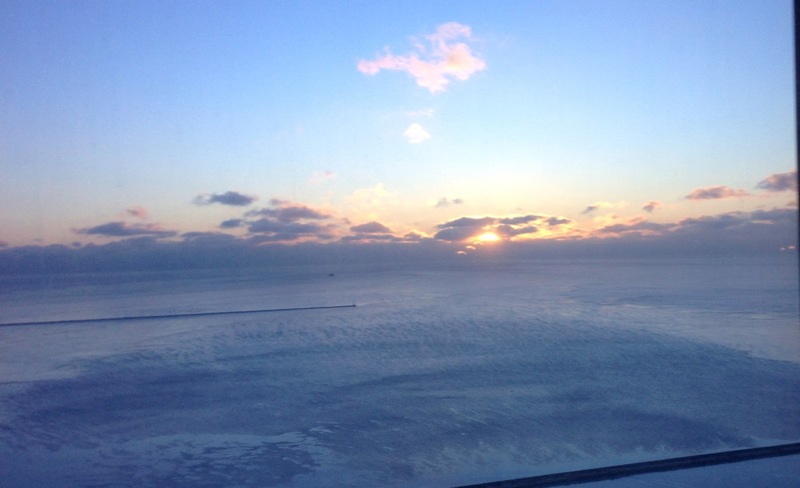 Here is another January morning sunrise. I wondered if the weather had anything to do with it. 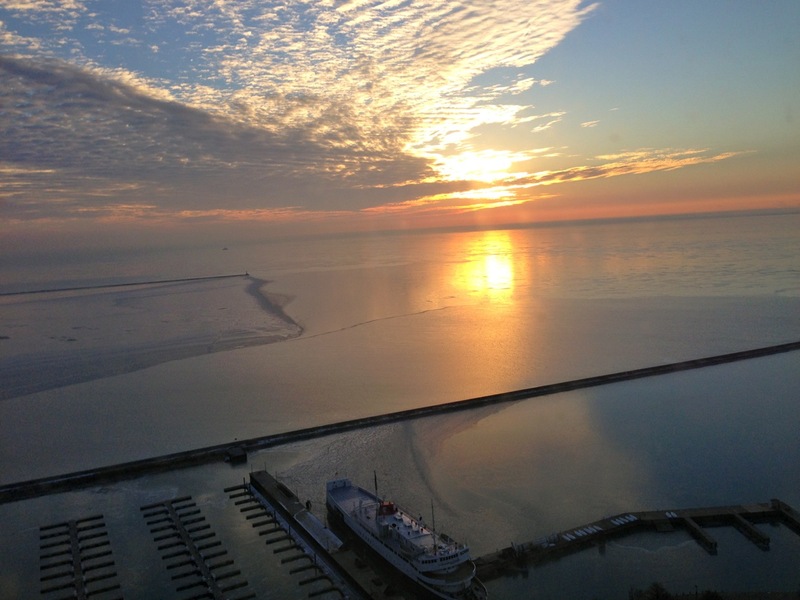 Chicago has been suffering from the arrival of winter. 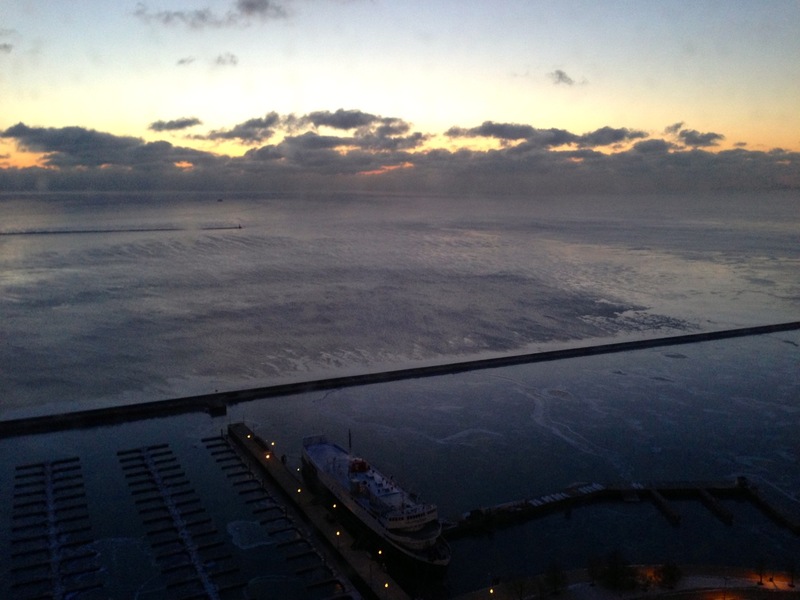 “Chicago’s coldest blast of air in 2 years is easing—but slowly. 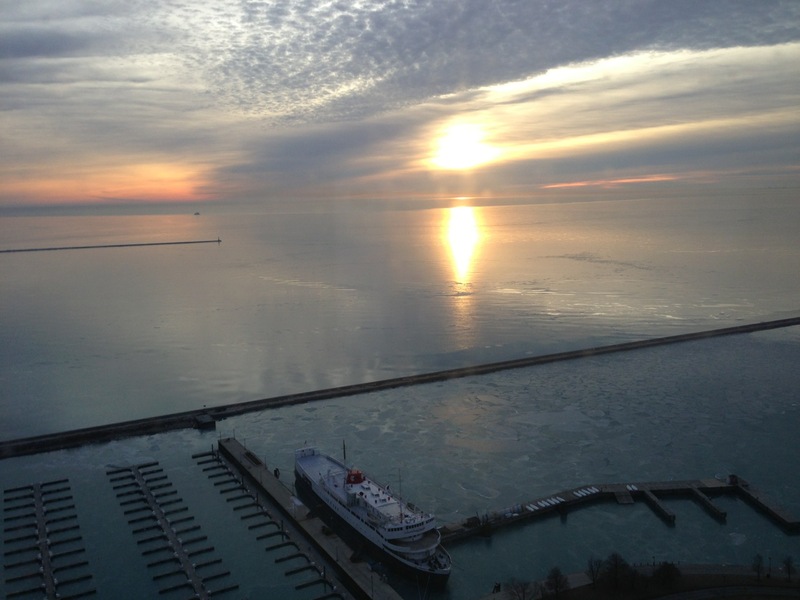 By midnight Tuesday, the area moved into a 55th consecutive hour of sub-20-degree thermometer readings and 46 hours with wind chills below zero. 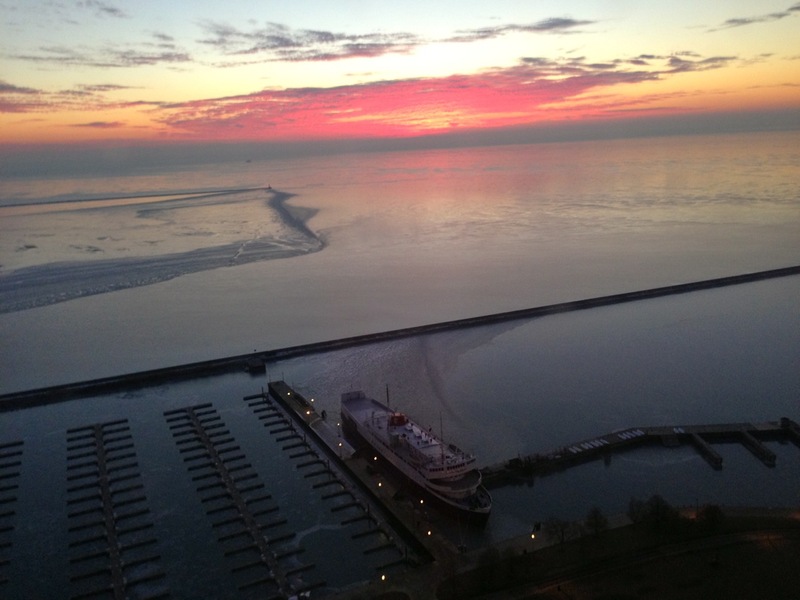 Tuesday’s 11-degree high and 1-below morning low put the day into the record books as the city’s coldest of the past two years,” according to the blog of Tom Skilling, the awesome local meteorologist. 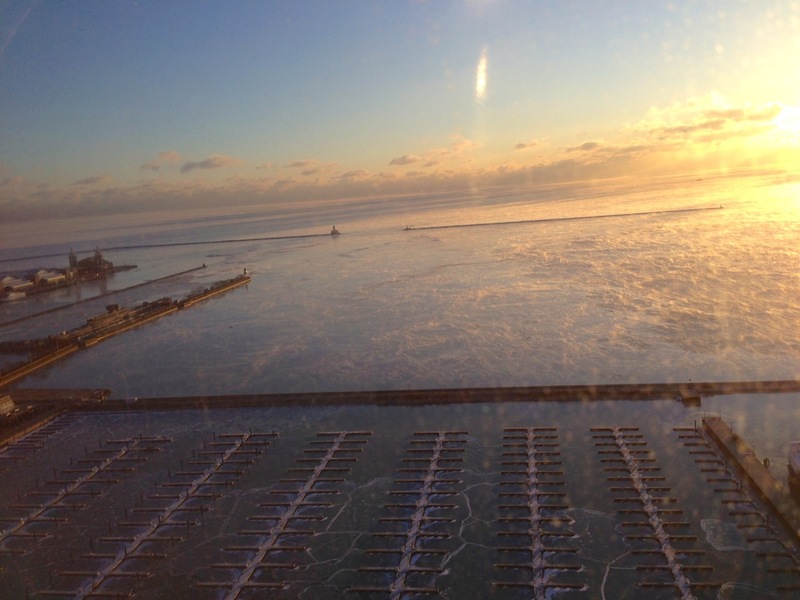 In this frigid weather, what looks like steam coming up off the surface of the lake is actually ice crystals. 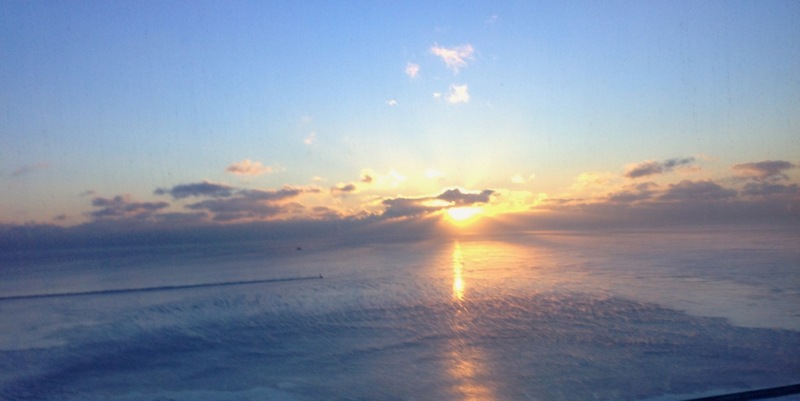 I don’t know what it is about January, but it seems to generate some of the more dramatic sunrises of the year. This was earlier in the current week. This reminds me of paintings I have seen and loved, dramatic, powerful, enlightening, uplifting. 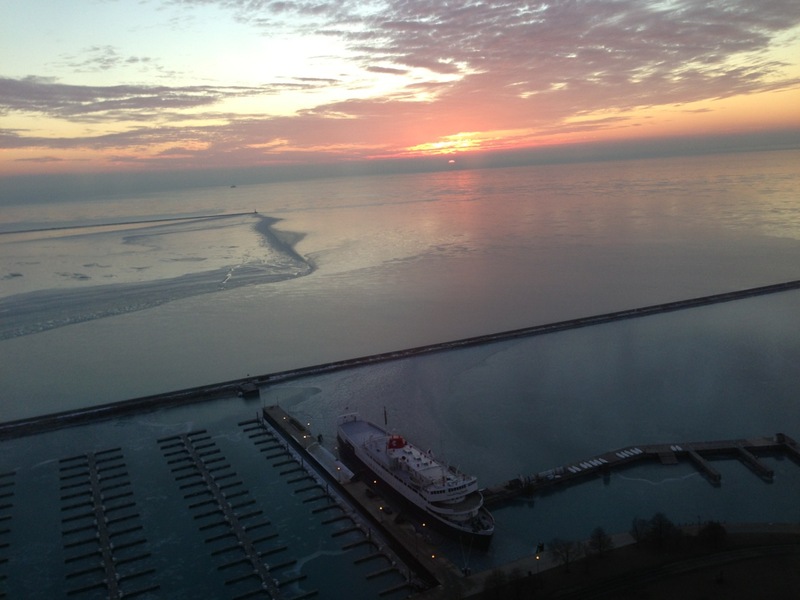 The normal high temperature in Chicago in January is around 32 F. Last week we had several days where temps ranged up into the 50’s. 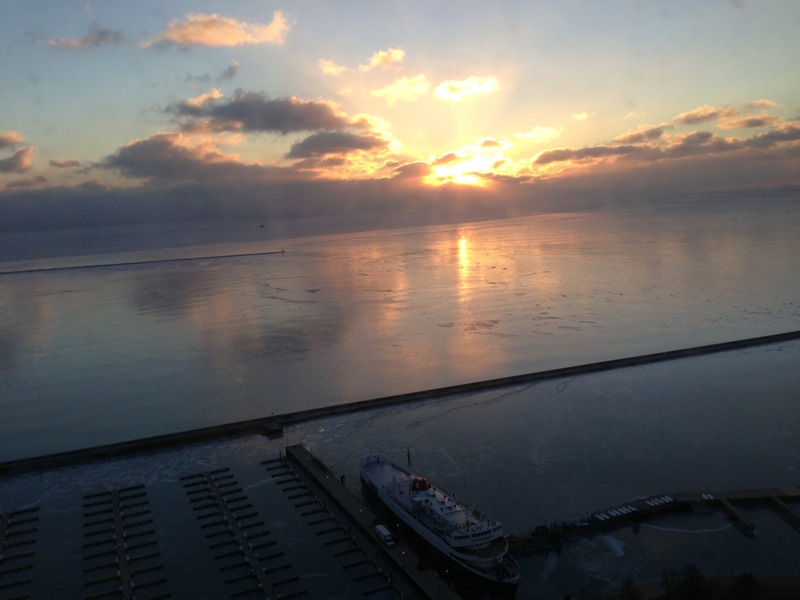 As a result the usually frozen solid surface of Lake Michigan yielded. I think the resulting ice mosaic is kind of cool. The sun had risen an hour or so earlier, but was hiding in the clouds. I saw this on my morning bike ride. 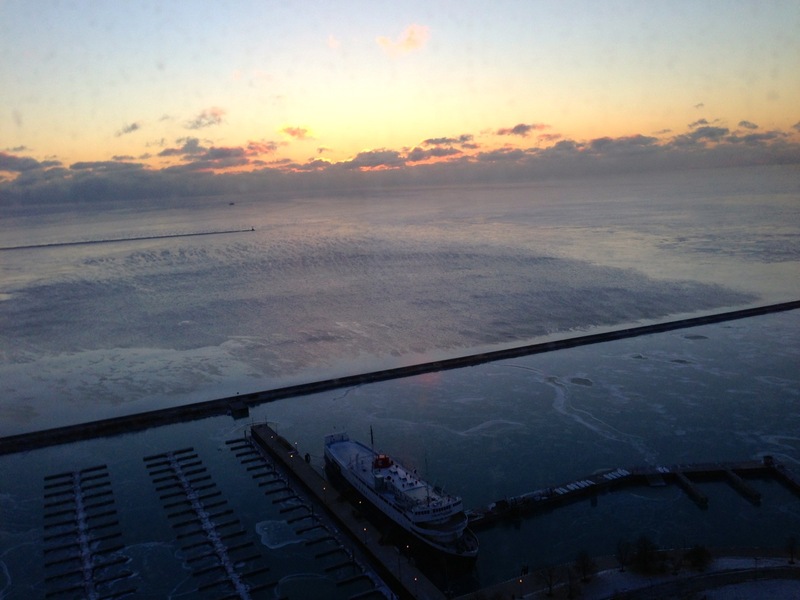 After a series of unpicturesque mornings, January fifth offered a dramatic contrast. I wonder what it is about January that brings about such dramatic displays.